I think we can all agree that social media has made a great impact on our lives, from the way we socialise and how we inform ourselves to the way we promote our business. It has both estranged us from some people who live close to us and brought us together with some people who live far away. 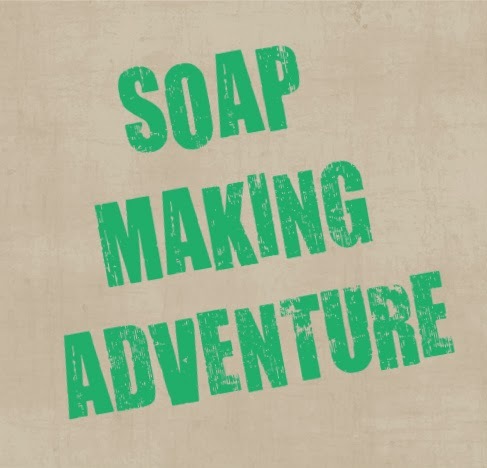 I'm sure most of you have had an oportunity to meet someone through Facebook or some other social media that you could connect on many levels, with whom you share interests, hobbies and/or political views. The fact that that person lives far from you and you haven't had a chance to meet in person didn't stop you from investing in friendship. I've met a few quite amazing individuals this way myself and Carolyne is one of them. We met trough Facebook couple of years ago. She lives in England, I live in Greece, but we have quite a few things in common, from the way we perceive life to the way we strive to explore our creativity. Carolyne Rushton studied Textiles at Goldsmiths University in London. She spends most of her time outdoors, on her green lot, growing organic fruits and vegetables and defending her back garden from foxes (yes, there are foxes in London...). 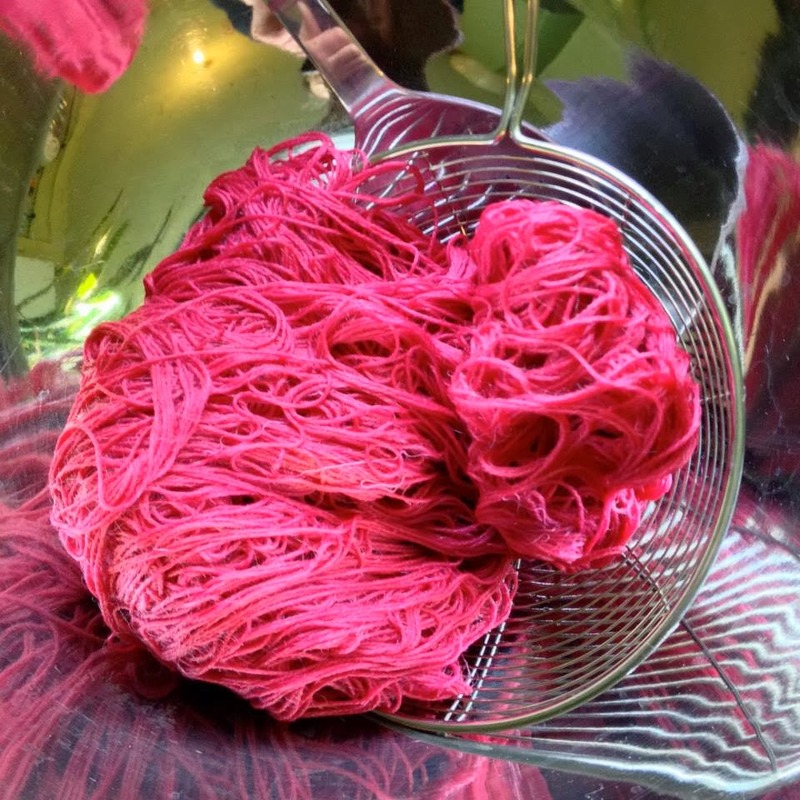 She uses those fruits and vegetables to make delicious chutney and sometimes she uses them to dye yarn and fabric, but more about it in another post. She is an amazing mom to her two daughters, an avid knitter and knows more about yarn and fabric dyeing techniques than any other person I know. 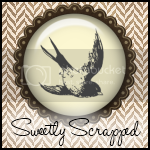 I've been browsing trough her photos on Facebook and enjoying the explosion of color when an idea struck me to ask her if she would like to contribute to this blog and share her knowledge. She said yes and this is the first in the series of posts on this blog that will be featuring Carolyne's crafts. Enjoy! Step 1: Put 20g of cochineal in a pan and then pour aprox. 1 litre of boiling rainwater over it. Leave it to steep for 30 minutes. Step 2: Bring it to simmer and hold for 20 minutes, then strain into dye bath. Step 3: Add another litre of rainwater and repeat extraction method twice more each time adding the same amount of rainwater. 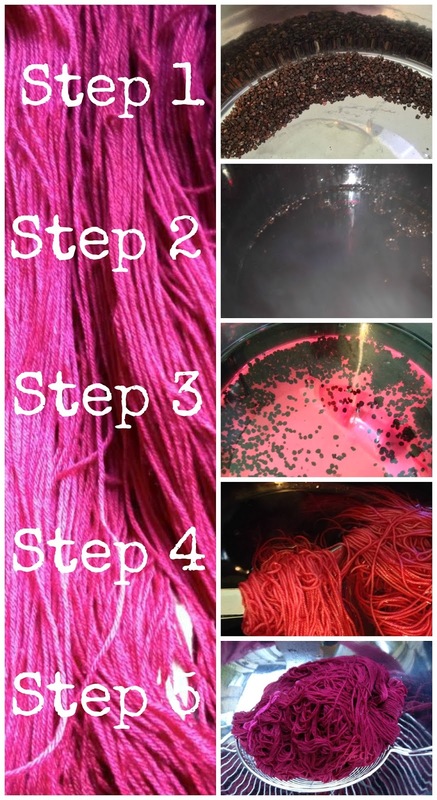 Step 4: Combine all 3 extractions in a dye bath and top up with rainwater (enough to allow the yarn to move freely). I added 100g 4 ply mulberry silk previously mordanted with alum. Bring slowly to 80ºC and hold for 40 mins. Step 5: After 40 mins remove from dye bath and drain. 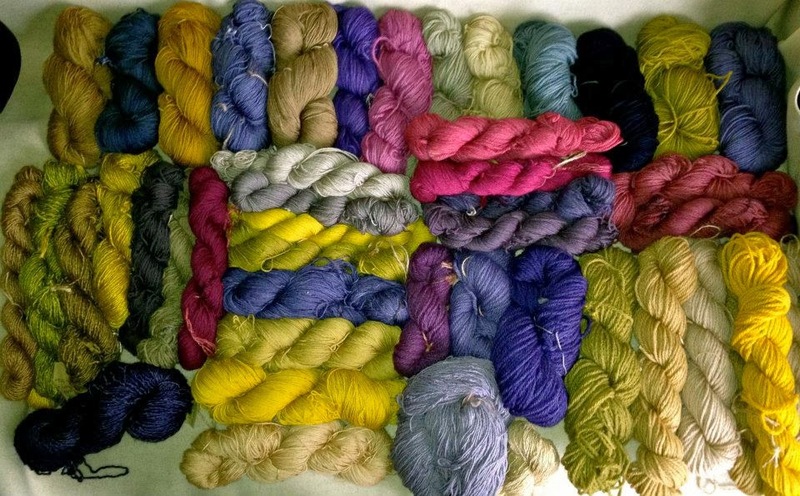 Leave dye bath to cool before adding more yarn for paler colours. Dry yarn flat and leave it for as long as possible before washing. 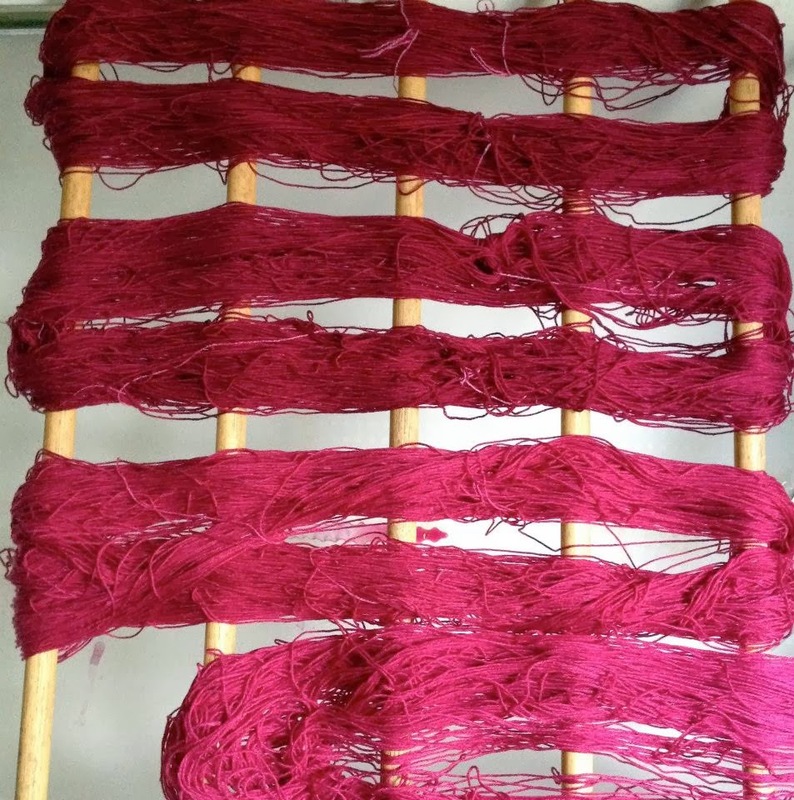 Here you can see how 4 ply mulbery silk turned out after the first and after the second dip. 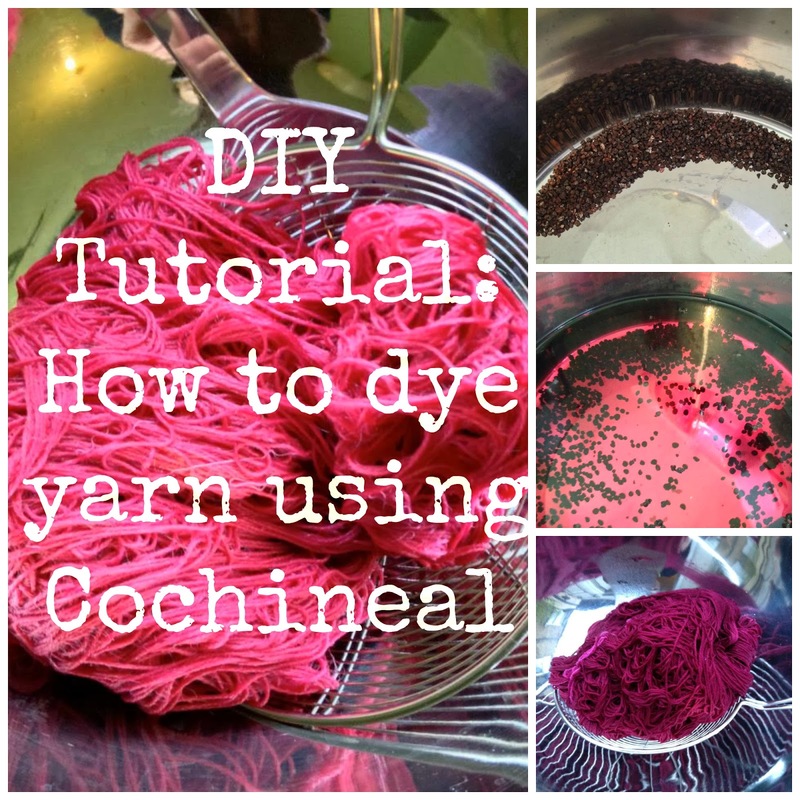 This is on of the online stores where you can purchase cochineal and other natural dyes. If you have an more questions, don't hesitate to ask in the comments section. Hvala Olja. Koliko vidim ova prodavnica čiji sam link postavila u tekstu šalje svoje proizvode i u inostranstvo, ali su troškovi transporta verovatno skupi za naše pojmove, a moguce i da carina pravi problem... Nisam uspela da nađem gde se u Srbiji prodaje Košenil (Košinel) kukac, ali čitala sam da se uzgajaju na opuncijama ( rsti kaktusa), tako da oni koji uzgajaju kaktuse verovatno znaju gde bi se mogli naci ili ih imaju i sami. Druga mogućnost koja mi pada na pamet je Poljoprivredni fakultet. Pozdrav!